Tamara + Michael’s love story began when they met in college at the University of New Mexico. They both happened to be in the same math class. Tammy was always late to class, and she always sat by herself near the instructor. She usually kept to herself until one day she was blinded with a laser straight to the eye. Mike’s idea of flirting was putting a red laser on her face during lecture. That was when she first started noticing him. He never talked to her, but every day at the end of class, Mike would hold the door open for Tammy, but never say anything. There were days where Tammy would rush out of class on purpose to see if it was just in her imagination, but sure enough, Mike would drop whatever he was doing just so he could open the door for Tammy to leave. When Tammy left, he would go back into class and finish getting his stuff. It wasn’t until the end of the semester when Mike was brave enough to ask how Tammy felt about their final. He went on to ask if she wanted to hang out and they exchanged numbers. That was it for a while. He text her a few times but she didn’t really text back or let him know she existed from the end of the semester to the end of summer which was nearly 3 months. Once school started back up, Mike and Tammy finally went on an official date. Their first date was super awkward. Mike picked her up in his blue lancer. Tammy was totally unaware that he learned how to drive in Japan where the traffic lanes are on opposite sides of the road. Mike still wasn’t use to driving in the US and the first thing he did was pull onto oncoming traffic! They were both pretty nervous on their date. Neither one of them could decide on a place to eat so they drove around and picked a hole in the wall Mexican restaurant that neither one of them had ever been to. Long story short, they shared fried ice cream and called it a day until date #2. Mike proposed on the beach where we had been relaxing most of the day. Just us and a few passerby’s. He secretly recorded the whole thing none of it felt real! Of course I said yes!!! 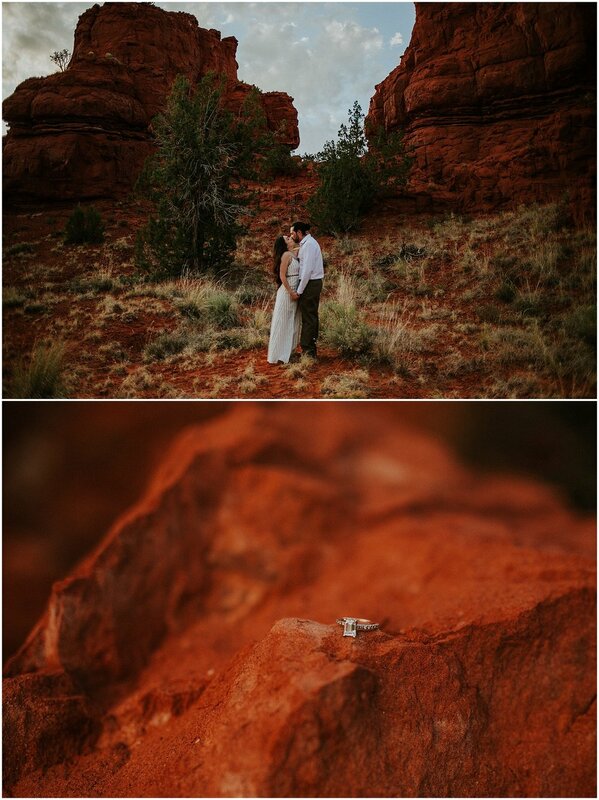 #UntilNextTimeRihanna"
I met Tammy + Mike in the wonderfully scenic Jemez Springs to document their love. Guys, their engagement sesh will ALWAYS be LITERAL GOALS AF. Tammy wore a beautiful dress from Wanderer and Mike was looking mighty dapper. Shooting in Jemez is an incredible delight that would make any photographer have a happy dance. Jemez has a variety of beauty whether it's the lush greenery or the beautiful red rocks. I had a blast with these cuties and to this day this is one of my absolute favorite engagements sessions EVER! Check out more from their epic e-sesh below. I will never forget the time spent with these two at these red rocks. <3 it made all of my photographer dreams come true. If you want to check out photos from their insanely romantic wedding at Hotel Parq Central in Albuquerque, New Mexico, click here.